By the time I had arrived at my first comfort drop it had already started, one of the volunteers was speaking to the kids about what comfort items are, and how to use them to self-comfort. I arrived with the children’s gift bags and the pillowcases that they were going to decorate for the day. So, we handed out the pillowcases and let them get creative. 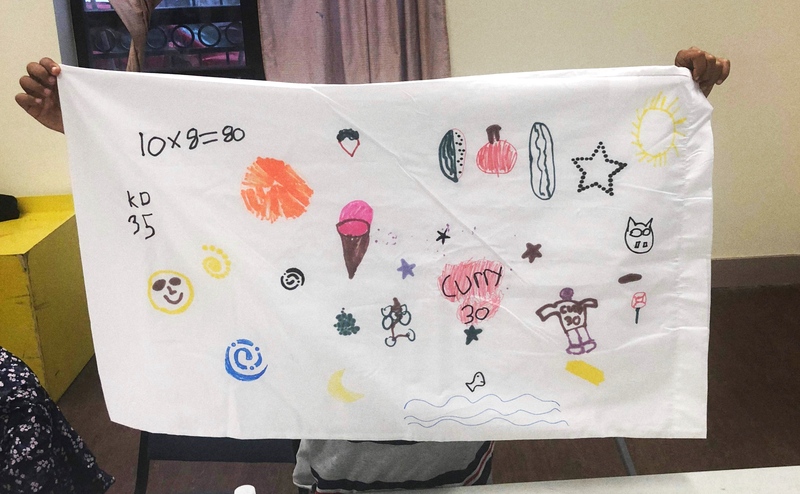 The purpose of letting kids decorate their own pillow cases is so they have reminders of a few of the things that make them happiest before they go to bed. During this activity all of the volunteers get to walk around and talk to the kids and help them decorate their pillow cases. This was my favorite part of the comfort drop (and I think every volunteer’s favorite part too). Since this was my first comfort drop, I was just following the leads of the veteran volunteers. I noticed them sit down with some of the kids, so I did the same. That day I sat down with a 9-year-old boy named Phillip. He was at first shy, which is what I expected, but then as he got to drawing he started to open up a bit. At first Phillip drew typical kid stuff like his favorite basketball player’s jersey and a basketball, but then after that he just stopped. I didn’t fully grasp the weight of his words at the moment, but instead I just spewed to him a list of all the stuff that makes me happy. After a few topics, Phillip and I found a common interest: Food. I told him that cheeseburgers made me happy, his face lit up a bit, he grinned and replied, “I love cucumbers and tomatoes!” And for about 5 minutes we kept going on and on about our favorite foods. By the end of the day Phillip had an ice cream cone, and various fruits and vegetables drawn all over his pillow. Helping Phillip realize food made him happy led to him opening about his other interests, such as math, the beach and the Black Panther. Although Phillip was adamant about not being in any of the photos taken that day, he did allow me to take photos of his pillowcase, which makes me extremely happy to think about how proud he was of it. When I got home later that night, I laid down and thought about Phillip. I thought about how he said he didn’t know what made him happy. I wondered if it was just him being a kid saying “uhhh I don’t know” when put on the spot or if he truly had so little that made him happy that it was difficult to think about. It made me sad for a minute, but then I thought about how proud he was of his pillow case and how excited he was to receive a fidget spinner and book along with other comfort items PDF provided. Hopefully Phillip is finding happiness in his new comfort items. Just want you to know that you are an amazing young lady, your presence this summer with PDF truly made a difference. I am certain I speak for the entire Board of Directors when I say, we wish you continued success in all of your academic and professional endeavors. Thank you Pastor Carter. It was a pleasure working with Precious Dreams this summer and I’m so grateful for all that I’ve learned from my experience. I am so proud of the work we all do and I’m so thankful to be apart of a wonderful organization.